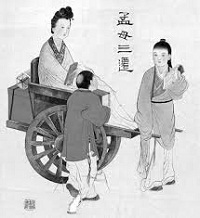 The Chinese of Mencius' Mother Moving Three Times--Meng Mu San Qian is 孟母三迁. Mencius (Meng Zi 孟子 372 – 289 BC) was a Chinese philosopher in Warring and States period who was arguably the most famous Confucian after Confucius himself. This story was about his mother moving three times to find the right place for Mencius's upbringing. Mencius was born in city Zou (邹城) located at the foot of Ma'an mountain in Chinese Shan Dong province. Mencius's father died when he was very young. His mother Zhang (仉) raised her son alone. At the beginning, they lived next to a cemetery in which funerals or religious activities were hold nearly every day. Mencius and other village kids liked to play a game imitating adults to staged these rites. Some kids even stole the sacrifices. Seeing this, his mother said: "“No, I can’t let my son live here." So they moved to live next to a marketplace. Soon Mencius began to be interested in observing and imitating their new neighbors, among which a butcher was his favorite. Mencius shaped clay into small piggies, cut them apart with a toy knife, and then hawked the 'meat' everywhere. His mother became more upset. "This is not the place I would like to raise my son, either" she said anxiously. As a result, they moved again. Finally they settled down near a school, in which all they saw was people treating each other politely, and all they heard was the sound of reading. At the first day of every month, officials, scholars and all students went to Confucius temple to learn and discuss the Confucius's theories. 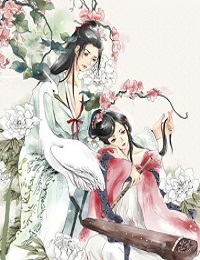 Inspired by these, Mencius naturally started to imitate the courtesy behavior and study habits of the students. Observing this, his mother smiled and said, "This is the place where my son should live ." Now, this story is used to show the importance of growing environment for children, that is, so called "peer effect". Peer effects are what happen when you hang around in the wrong company. Although some experts argue that the evidence for the existence of peer effect is far slimmer than people assume, most Chinese parents still deeply believe their children's performance will suffer, if they are surrounded by too many of the "wrong" type of kids. I think this is at least partly attributed by the popularity of this story.